As 2015 draws to a close, I’m looking ahead to a new year at Disney Parks. In this edition of Disney Parks Blog Unboxed, I’m revealing 16 new products that will make 2016 an Unforgettable year at Disneyland and Walt Disney World Resorts. Check out the video below to see what Rob, the Disney Delivery Guy, delivered to me early one morning at the newly expanded World of Disney in Disney Springs Marketplace. The items shown in the video will be released throughout 2016 (I don’t have exact dates at this time). Once released at Disney Parks, you may find select items using the Shop Disney Parks mobile app. This free app gives you access to thousands of products we carry at Disney Parks which you can have shipped directly to your home. To download, please visit DisneyWorld.com/Shop. I’d love to hear which item is your favorite. Please share in the comments below. The parade Ts, Shellie May and the pins. I wish the HM Tsum Tsums were going to be sold on line. Hello, I noticed you said the Beauty and the Beast Dooney and Bourke bags would be released in late summer, is there an exact date or month yet? Hi! Would you please give an update re the monthly “Disney love letters” pin collection. You showed one applicable for 2/14, and since that’s my 39th anniversary….. Many thanks. Do you know when the Polynesian trash can ornament will be released? Also, any word if Disney will continue releasing Its a Small World dolls? There’s more countries they haven’t released! Do we know if the Dooney & Bourke Beauty and the Beast is going to be available in a wallet? any word/news if the popular Wonderfully Wicked Villain pin set is continuing in 2016? Thank you Steven! 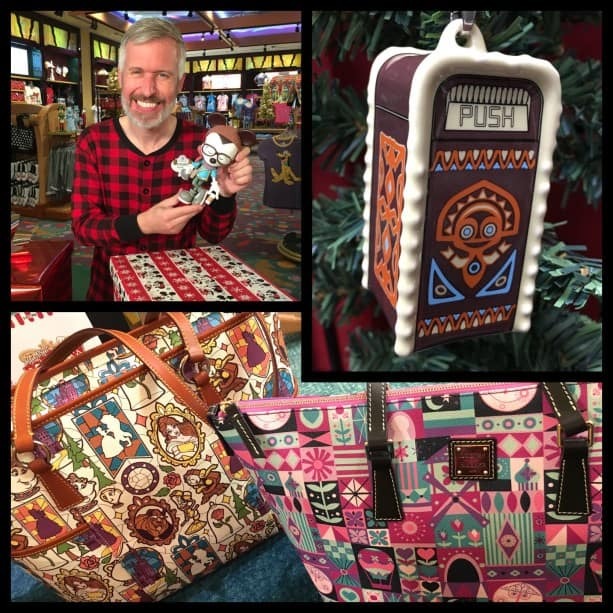 Any idea on when the Mary Blair/Small World Dooney will be released, I am in LOOOOOVE! Happy Holidays! Hi Steven! Loved the video. Any idea when those cute pins will be available? I’m a HUGE Up fan and just melted when I saw that pin…Thanks! Will there be other patterns introduced? DVC/AP discount through the app??? OMG ALL OF THEM! But if I had to choose, the Metal Earth models, PoC Battleship, Orange Bird T-Shirt and the Haunted Mansion Tsum Tsums’s are musts. Love the Small World Dooney! Still wishing for a holiday-themed Dooney and those long-awaited Orange Bird kitchen towels. Any news…? Wonderful podcast with the perfect host. Nobody does merch like Disney does merch! Extra excited about the ornaments and Shellie May (always happy to see Duffy and Friends). Give Steven Miller more stuff to do! @Stephen – I believe they will be released in early 2016. No exact release date at this time. @Isabelle – I hope you have a great trip. Sadly, the Beauty and the Beast Dooney & Bourke item won’t be released until late summer. any idea when or if the app will start taking Disney Gift cards???? @Amy – I know the Shop Disney Parks app team said it will be part of a future update. I don’t have an exact timeframe. A B&B D&B? I knew I was waiting for the “right” print – there it is! I can’t wait for the Orange Bird shirt! So sad I missed it the first time. Hopefully they will release the other styles, too! @Marlo – The “it’s a small world” Dooney & Bourke will be released in late spring, early summer. I don’t have an exact date at this time. Awesome! Any word on if there will be a 2016-themed MagicBand like there was for 2015? “it’s a small world” Dooney?! You just made my 2016 complete. I’m glad you gave us some warning so I can put the appropriate amount in my “Steven made me do it” line item in my 2016 budget. In love with the Beauty and the Beast Dooney! Hopefully it is released for February when I go to WDW for my University graduation trip! @Darian – The Beauty and the Beast Dooney & Bourke is coming in late summer. Was *really* hoping for something from the 45th collection being featured. Metal Earth icons seem the most interesting to me. OMG!!!! The Beauty and the Beast Dooney. My sister and I may have just screamed out really loud. That would absolutely be the most amazing birthday present for my sister. Haunted Mansion Tsum Tsum! I am so excited about this, any idea when in 2016 these will be released and if they will be on the disney store or just in the parks? @Melissa – I would look for them in Q3 which is April-June. I don’t have an exact release date. They were created for Disney Parks which means you will only find them at Disney Parks, not Disney Store. Please please ask them to put the Dooney bags out in different styles! I don’t need another big tote!!! Why is it that app doesn’t apply CM discounts yet? Is this going to be changed soon? @Dawn – The Shop Disney Parks app team said that Cast Member discounts will be part of a future update. I don’t have an exact time frame that will happen. The Flower and Garden Shelliemay plush looks cute and will there be a Duffy plush for the flower and garden festival? @Jonpaul – I’ve only seen a ShellieMay plush bear for the 2016 Epcot Flower & Garden Festival. These items are amazing! I can’t pick a favorite, but it’s between Shelliemay (I already purchased two from the Shop Disney Parks App upon her release), the tsum tsums (I gasped. Kind of fitting for HM), and the Beauty and the Beast Dooney. Any ideas of the styles it will be available in? @Elizabeth – I’m glad you liked the video. I don’t have all the details right now about the Dooney & Bourke items. I’m sure I’ll have a follow up story once things are finalized. I must know when the Beauty and the Beast Dooney will be released??? Any ideas? @Jennifer – I was told late summer. Can we purchased any of these new items online? @Michael – The items shared in the video are not available just yet. When they are released in 2016, you may find select items using the free Shop Disney Parks mobile app. To download, visit http://www.DisneyWorld.com/Shop.